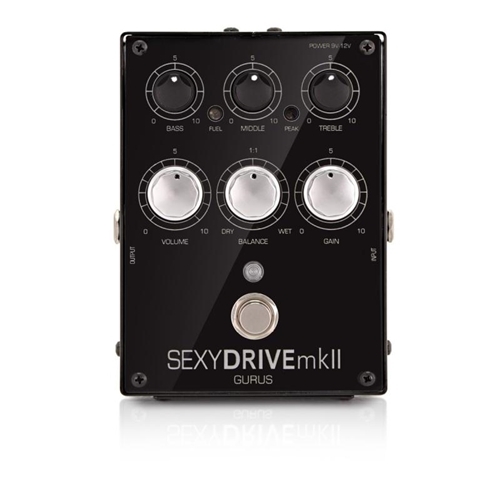 The new SexydriveMkII keeps all the same features of old SD, wich was appreciated as one of the best OD/BOOST in the market, with an outstanding dynamic and amp-like response. Now, we took inspiration from some of the most important "OD-Tone" of the past, from Dumble amps to Klon Centaur and many others and we added a "Blend" option, with a control called "Balance" that provides to mix the clean signal with OD to revive pick attack and increase the dynamic feeling.. that's pretty awesome to play! A little hole in the bottom let you access to a trimpot that sets the min/max level of clean (buffered) signal to handled by "Balance" pot. The two little windows on the faceplate shows the "Peak" (Drive) and "Fuel"
indicates when battery's level is too low. (if Powered by 9V Battery).